At 13 years old I asked my parents if I could start investing money in the stock market through a mutual fund. I’d saved about $1500 from starting my own hog selling business, and through working in the fields during the summer. My small nest egg was the result of 4-5 years of hard work, and I wanted to watch my money grow. So with my parents permission I started researching stocks and mutual funds. Through our local church I’d heard about AAL Mutual Funds [now Thrivent Financial] , and we had a local rep who worked at our church. Over a few months I started to track their funds, and found that the AAL Growth Fund was a good option. For someone who had 50+ years for their investment horizon I felt that I could buy a riskier stock, and is what my local rep advised too. When I told my parents what fund I’d decided to invest in, then they lined up a meeting with our rep. The rep I had was about 65+ years old, and during the whole meeting he asked me if this was really what I wanted to do. It was as if he’d never had someone as young as me want to invest in stocks. After going through the sign-up process, and agreement on the initial fees and annual fees, then the last part of the forms was having a guardian’s authorization. When I came to this section I distinctly remember both my mom and broker looking at me and asking, “Are you sure you want to do this?” Doubt came over me, but I knew long term that this was the right thing to do. As I look back at that experience I realized that encouraging kids to invest early can have many advantages. 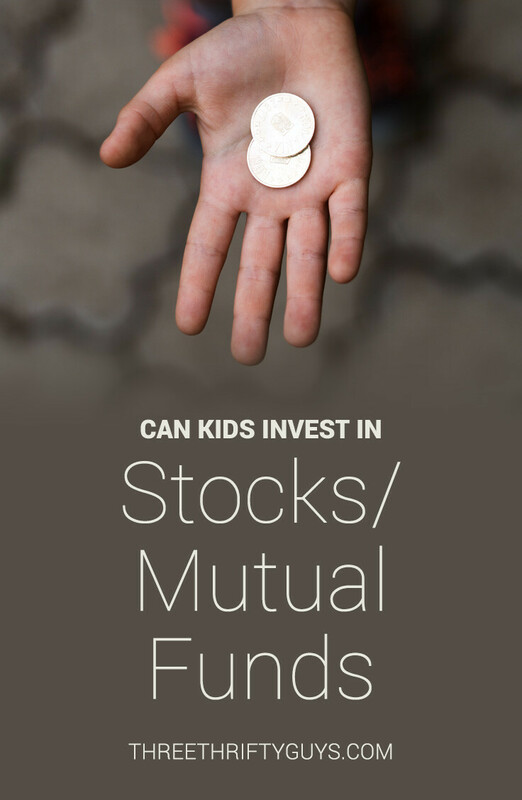 However, there are a lot of things to consider first, and here a few options to consider before letting your kid invest in stocks or mutual funds. Start out small by either buying a single share or using a service like sharebuilder.com. To help motivate kids, then consider what oneshare.com offers its customers. With the purchase of one share, then you’ll also receive a framed certificate of your stock (like how stocks use to be). This would make a great option for a grandparent that might be looking to buy a gift for a new grand baby! Secondly, another good option would be to look at buying a well diversified fund. Especially if this will be your child’s sole investment. You never want them to risk their entire nest egg on a penny stock or hot new technology company. A couple options I’d recommend would be the following Vanguard Funds: Vanguard Target Retirement Fund 2060, Vanguard LifeStrategy Growth, or Vanguard Star. If your son or daughter is looking at saving for college themselves, then consider investing in your state’s 529 plan. Depending on your years to graduation, then you might want to consider less risky investments (more centered towards bonds, income, money market funds). A drawback to having your child self invest in these state plans is not being able to take advantage of the state tax deduction (some states offer deductions – not all). Since children often have a low $ income, then capturing this deduction may not be your best option. 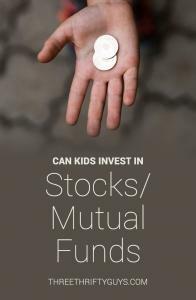 When your child is thinking about investing their hard earned money, then don’t council them to invest in less risky stocks, because “that is what you’d do.” Your child has a very long time horizon, so making it through tough times is easier. Any bad 10 year performance won’t mean anything, because they’ll have 40 years to make it up. So be sure to know your child’s risk tolerance, and not force your views of the stock market on them. I’d love to hear other people’s stories on when they started investing or how they advise their children to start investing? Useful discussion – I loved the specifics , Does anyone know if my company could possibly grab a blank New york state dmv form ds 449 copy to use ? That’s a great story. I have always been a saver, but I never went as far as actually investing in a mutual fund or stock. My parents had me open up an ING Direct account because they were paying between 3-4% at the time. That being said, I did do quite a few of those stock trading games where you get x dollars of fake money and compete against others. This gave me some more experience without actually taking the risk myself. I remember opening an investment account when I was 16 and the rep was so shocked that someone as young as me would want to start. I worked in the summers and after a while it starts to add up. I figured I already knew I didn’t need to spend it all at that point so why not save it for later. It’s a good thing for them they let me open it and didn’t discourage me because I still have a fund through that same investment company. I think all teenagers should be encouraged to start investing, even if it’s only a small amount each month. I wish someone had taught me about investing at a young age. I think it’s a great lesson and probably would have avoided some of the confusion I feel about it to this day. See, I just started investing. My parents didn’t do much of it except for what they do in their 401ks, so I have had to figure it out now. I plan on teaching my son about it later down the road and allowing him to research and pick stocks. I think it would be a good learning experience. In a year or two, I’m going to start my son out with the “one-stock” approach, giving him a company he’s familiar with that has a solid future so that he can get his feet wet. ETFs are, of course, best, but I think he’ll be more interested in the romance of owning a tiny piece of a company he loves.